Hello Everyone! This guide will help you understand how to get started with crafting, and how to obtain your needed designs and recipes. This may also help you decide which crafting profession to master. 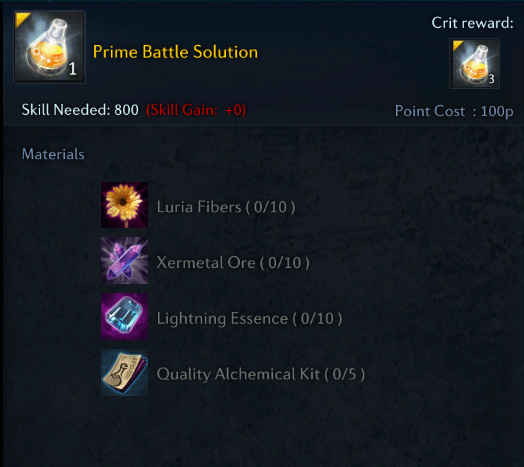 Gathering and crafting in TERA, uses your production points (PP). Each time you attempt to gather or craft, you spend a specific amount of PP. Each player has 4,000 production points that is shared across all the characters in that account per server. Once you reach 0 PP you are unable to gather, or craft. PP regenerates overtime, at a rate of 5 PP/ 5 minutes of real time–whether you are online or offline. So you can regain 60 PP per hour, or 1440 PP in a 24-hour period. It takes about 67 hours or a little under 3 days to recover full production points from 0. So be careful not to accidentally spend all of your production points. It happens easily if your pet is set to auto-gather, of if you leave your character auto-crafting. Alternatively if you’re filthy rich, you can use “Crafter’s Cure” to instantly restore 1,000 PP. Or “Crafter’s Cure-All” to instantly restore maximum PP. These Crafter’s Cures are available from the Crafting Merchants, the TERA store, or from the Elite Status daily consumable box. To craft anything, you’ll need to learn the recipe/formula. Then acquire ingredients & mats for your recipe. And finally, make sure you have enough production points to craft the item (or batch of items) you need. You can save time by looking up recipe beforehand, and stocking up on the mats you need. Recipes can either be bought from NPCs, or dropped by mobs. To find a recipe vendor, head to one of the crafting stations in a major city. You’ll find the NPCs standing nearby the crafting stations, of the item type. The recipe vendors sell most of the crafting recipes, with the exception of a few rare ones. Crafting stations are found in every major city (Velika, Allemanthia, Kaiator, and Highwatch). Each crafting station includes a Crafting Formulas merchant, a Crafting Materials merchant as well as a crafting workbench. Tip: You can also craft “on the go” by placing a campfire, then opening your crafting menu (Press J), and crafting as you would with any crafting station. The fire can substitute for any specific station. You can buy every basic recipe, as well as some advanced ones from the merchants near the crafting stations. Always check the Crafting Formulas merchant before buying a recipe from the broker. 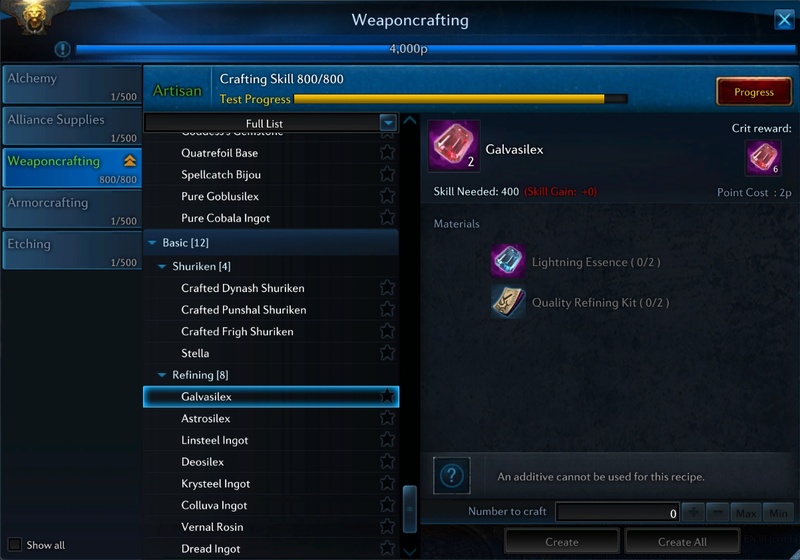 Designs have different Crafting Skill requirements, and as your Crafting Skill increases, more designs will become available to learn and use. To use designs in the Artisan tab, you must have Artisan or better proficiency. (See Crafting Skill Proficiency section for details). When you hover over a recipe, you can see what level crafting proficiency you need, the PP cost, and what materials you need. Right-click on the recipe to learn it, and press J to bring up your crafting window and see the recipe details. You’ll be able to see which ingredients (materials or “mats”) in the recipe, as well as a sufficient amount of Production Points to craft the item. Different items will require different recipes, mats, and may cost different amounts of PP. Mats for recipes can be acquired by purchasing from the Crafting Materials merchant, farming them, or buying them on the broker. You can often farm mats from gathering or killing mobs. Tip: Most mats change based on level progression, with the exception of some end-game mats which are rare drops that can be found anywhere, at any level. Other end-game mats, can only be dropped in specific dungeons, bosses, or mobs. Once you have your ingredients, go up to one of the appropriate crafting stations, and scroll through the different recipes to find the one you’re trying to make then you’re ready to begin crafting. You can craft anything from any profession, as long as you have leveled up your skill high enough to learn the recipe for the desired item. To increase your crafting skill, you need to craft more items of said profession. 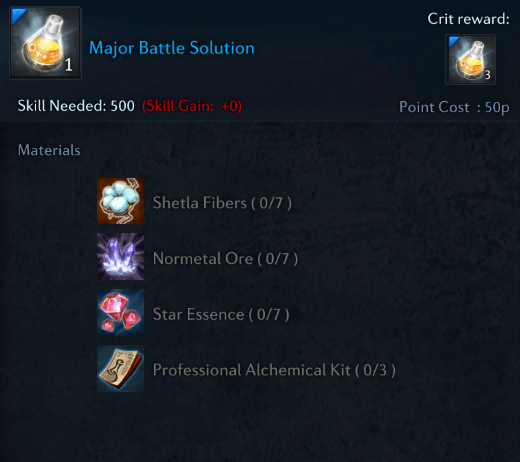 Each item you craft will grant different amounts of profession skill points. Some recipes are able to crit during crafting. Crit crafting can produce more of an item (3 crafted items vs 1 crafted item) or a superior item (Pure Titan’s Fire vs Titan’s Fire) or even a different item altogether (White Dendrite vs Temporary Etching 1). The crit chance is different (and not revealed) for various craft items. To check if a recipe can crit during crafting and what a crit can produce, check the right side of the crafting window as shown below. When you are ready to craft and meet all the requirements, you get an option to include an additive when crafting for Artisan recipes and above. Additives increases critical success chance by approximately 15% for artisan-level crafts, and approximately 25% for master-level crafts. Each time you use an additive while crafting, the additive gets consumed. If you have at least one appropriate additive and meet all the requirements to craft, you can right-click on the right slot to apply an additive to the craft. Additives may be a good idea for single high-cost items such as brooch crafting, but not recommended for more common low-cost items such as Pure Cobala Ingot refining. Always consider the cost of the additive in addition to the cost of the mats, compared to the cost of the final item, when trying to decide whether to use an additive or not. The type of additive used depends on the proficiency of the recipe and item made. Artisan Additives are used for Artisan recipes, while Master Additives are used for Master recipes. There are three tiers of proficiency for every profession: Basic, Artisan and Master. To advance from one proficiency to the next, you must meet a requirement of minimum Crafting Skill and complete a test. To advance from “Basic” to “Artisan” proficiency, you must earn 500 points in a profession and complete an Artisan Test. This test usually requires crafting various types of items with different crafting skill requirements. Once you have completed the test, you can now progress towards the “Master” proficiency. To advance from “Artisan” to “Master” proficiency, you must earn 800 points in a profession and complete a Master Test. This test also usually requires crafting various types of items with different crafting skill requirements. You can only Level up one skill into Artisan rank, and that’s the same and only one that you will be able to level up to Master rank. There are four main crafting professions: Alchemy, Armor Crafting, Weapon Crafting, and Etching. When choosing your profession, it helps keep in mind which ones are most needed by you or in high demand on the market, as well as how much effort is required to farm for mats, or how expensive those mats are. Tip: You can check the “show all” box on the bottom left of the crafting menu, to see all the recipes of a profession, as well as what Ingredients they require. Most ingredients can be purchased on the broker. This Profession is used to craft Battle Nostrums and refine Hijka Oil for Weaponsmithing use. Tip: This profession is not recommended. Although needed in combat, Battle Nostrums can be purchased from the General Merchant and is provided for free as an Elite perk. The only endgame relevant craft is Hijka Oil, which can be used in Weaponsmith crafting to make brooches. As the name indicates, you craft armors with this profession. At the entry levels, you can craft cloth, leather and metal armors. At artisan level, they make low-tier armor for endgame content, as well as oils used by other professions. At Master level, they make mid-tier armor and Rare Brooches. Outside of crafting Brooches and oils, this profession currently has limited use at Artisan or Master skill level, with the exception of crafting oils which are high in demand by Etchers and Alchemists. Made by artisan armorcrafters, and used by master etchers. Etching is necessary for endgame, so Aterstod Oil will be popular with those crafting etchings. You only need Artisan proficiency to craft, but this is a fairly profitable craft. Crafting the patch’s current mid-tier armor may be lucrative if you can afford to front the cost of mats, especially the gloves since it is the most troubling item of armor to get as a dungeon drop. Designs will often drop in various mid-difficulty dungeons and can be found on the trade broker usually for anywhere from cheap (less than 1k gold) to expensive (20k+). Monitoring which classes are popular and well played by your server’s population may give you a hint on what type of armors to craft. A Superior brooch like Quickcarve or Empowered brooches is basically almost a necessity for endgame players. If you can get your hands on a brooch design, the mats are relatively cheap and/or easily gathered. Brooch designs are specific for crafting professions, so be sure to check which design you are getting. 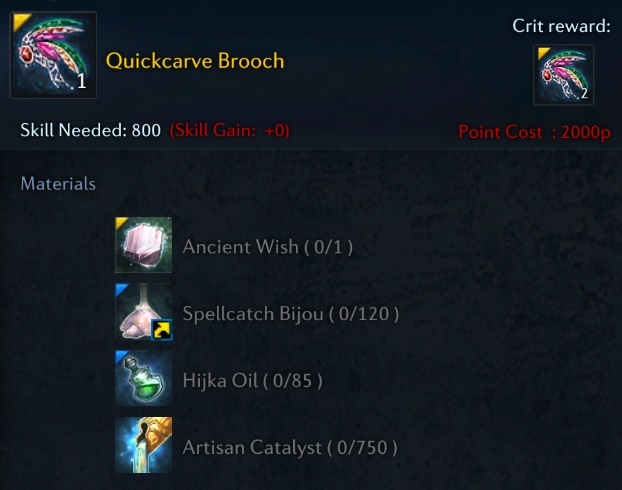 Crit crafting brooches can yield two brooches instead of the usual one, and can be good profit. For the min-max veteran players and/or expert merchants, you can also try your luck at crafting the newest and strongest Quatrefoil Brooch. This requires a lot of expensive mats, but again crit crafting can yield two brooches. Just like Armorcrafting, this one is self-explanatory and also has the same crafting concept, but you craft weapons instead. At artisan level, they make low-tier weapons for endgame content, as well as oils used by Armorcrafters. At Master level, they make mid-tier Weapons and Rare Brooches. Currently, this profession has limited use at any skill level, due to avatar weapons and the easy access to weapons from end-game dungeon drops. The main use from this profession is the ability to craft Rare Brooches and oils. Made by artisan weaponscrafters, and used by master armorcrafters. Though not as necessary as other types of oils, they are used in brooch crafting by armorcrafters. Crafting the patch’s current mid-tier weapon may also be lucrative if you can afford to front the cost of mats. Designs will often drop in various mid-difficulty dungeons and can be found on the trade broker usually for anywhere from cheap (less than 1k gold) to expensive (20k+). Monitoring which classes are popular and well played by your server’s population may give you a hint on what type of weapons to craft. This profession is used to make Tier 1, 2, and 3 etches. Etches add an additional stat to your armor, or weapon. Its very useful for end-game content, but has no use at lower levels until leveled to Artisan. This profession heavily relies on a critical craft. As some of the items required for your master test, and to craft some artisan, and master items, can only be attained by critting. Tip: This is currently the most lucrative profession, but at a risk for large profit loss. Etching is almost completely useless at lower levels, because the only craftable items before you’re an “Artisan” are scarab powders. However, at higher levels you can create Tier 3 Etches which are highly priced on the markets across most servers. But to craft these, you require items which you can only get through crits while you craft a more basic version. Important: Almost every single item used to craft a Tier 3 etch is acquired through critting on previous, lower level crafts. Every single material used for a Tier 3 etch, and a Tier 2 etch is considerably expensive. So each time you fail to crit, you lose a lot of possible profit. Because of this, some etchers mainly focus on selling Dendrites, Titan’s Fire/Ease, or Pure Titan’s Fire/Ease. To get a Pure Titan’s Fire, you need to crit while crafting “regular” Titan’s Fire. The white dendrites for this recipe are made as a result of critting on a Tier 1 etch. If you crit while crafting a Tier 2 etch, you get a permanent version of the etch, which is required for crafting a Tier 3 Etch. Critting on this recipe, will result in crafting a White Dendrite. If you would like to change your profession after you complete your artisan test, you can always buy Revival Fruits from Crafting Merchants in the Misc tab. Be certain when you do this, since any advanced designs you may have learned will be deleted. For the most part, we recommend that instead of resetting professions, you level a new profession on another character instead. Is crafting still relevant and something that should be worked on or is it more or less useless now? Leveling some crafting, like weaponsmithing and armorsmithing, is difficult because to pass the master proficiency test, you need to make some outdated gear. However, once you can get past that, every crafting has at least one crafting recipe that is relevant and profitable.